Admissions Open at Arid Institute of Management Sciences's Main Campus for the batch Fall 2018. ARID offers admissions in different fields of study for Bachelor and Master Programs. 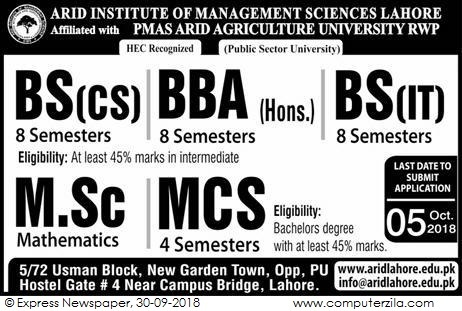 University DescriptionSABAC - Arid Institute of Management Sciences was established in 2014 under The Education Society Lahore, Govt. Act 1884 and affiliated with world most prestigious PMAS. Arid Agriculture University Rawalpindi Pakistan. We are committed to prepare our students to work, acquire skills and enhance their capabilities that equip them adequately to live in rapidly changing global environment. Campus Adress5/72 Usman Block New Garden Town Opp Punjab University Hostel Gate # 4 Lahore, Pakistan.